Lyric Arts had a chance to interview Aaron Booth who is performing as Jeter in Footloose . Read on to hear what he has to say about his experience thus far! LA: Tell us a little bit about why this particular musical interested you? AB: This musical interests me due to both the high energy nature of the show and the focus around one of my favorite subjects: Dance. LA: For those that are unfamiliar with Footloose can you tell us about the show? AB: Ren and his mother Ethel after being deserted by his father move from Chicago to this “little hick town” in Texas where policy is run by Rev. Shaw. In this town of Beaumont, dancing is illegal. AB: I play the part of Jeter. I am one of the teens in Beaumont, and one of Willard’s friends. I am also one of the three teens that are friends of Ren in the first scene in Chicago. AB: Everyone should come to see Footloose because we have a very diverse and talented cast from a variety of backgrounds. This is a high-energy show that will appeal to many different age groups. AB: I see all of the characters developing well, and in what appears to be a coherent way. Last night was the first time we have run act 1, so I was fascinated by where everyone has come since our first table read a couple weeks ago. LA: What do you feel are the “wow” elements of Footloose? AB: The wow element of this show is obviously the dancing. This is a very dance heavy show. AB: My favorite aspect is by far the dance. However, all of the songs are fun to sing and put my energy into as well. LA: Tell us what is something that you are particular excited about this show coming to together? For example, a certain scene, costumes, set, lights, etc? AB: I am excited for our first rehearsal this week on the actual stage. We are moving from the rehearsal room and dance studio down stairs to work on what has been assembled so far as far as the set goes. AB: My favorite musical would have to be Billy Elliot. I love the subject of the show, a boy’s fight for the right to dance. The show as-well has many subplots that I feel work well together; such as the community’s fight against Maggie Thatcher for the right to work, and Billy’s friend Michael’s desire to dress up in women’s clothing and his homosexuality. The show is so much deeper than it appears upon first viewing on the surface. And of course the choreography by Peter Darling, and the music by Lee Hall and Elton John are some of the best in the business. I can relate a lot to Billy in this production, which I suspect is the reason that I am drawn to the show. AB: My dream roles to play on stage are Robert in Company and Finch in How to Succeed in Business Without Really Trying. AB: The first production I did, with the exception of concerts and little things I did when I was younger, was How to Succeed in Business Without Really Trying. I did this production in 2006, my sophomore year in high school. I was a member of the ensemble (chorus). 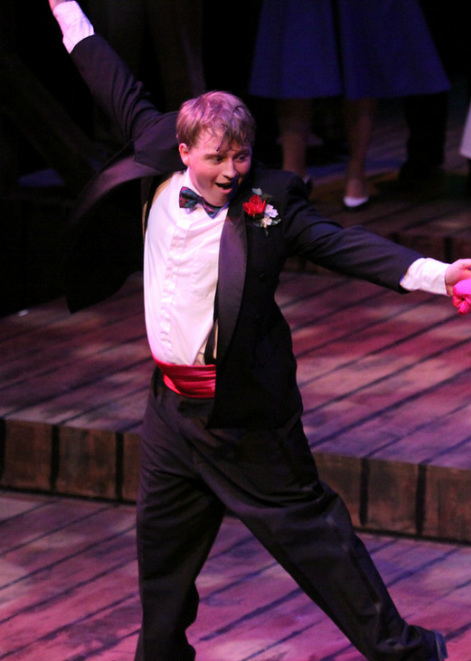 AB: This fall I will be a Senior Theatre major at the University Of Minnesota Morris. I love live theatre, and I am a huge Yankees fan!